The Baby Safety Gate is made from strong steel construction and is assembled and ready for use in 5 minutes, all fixings are provided. 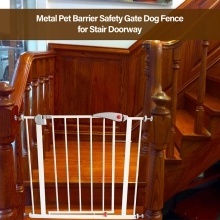 This white and grey color Metal Baby Safety Gate fixes to the top or bottom of the stairs, at drawing room doors and hallways to keep all members of the household where they should be. Suits for: Cat, Dog etc.